The antibody response is crucial for preventing many viral infections and may also contribute to resolution of infection. When a vertebrate is infected with a virus, antibodies are produced against many epitopes on multiple virus proteins. A subset of these antibodies can block virus infection by a process that is called neutralization. Antibodies can neutralize viral infectivity in a number of ways, as summarized in the illustration. 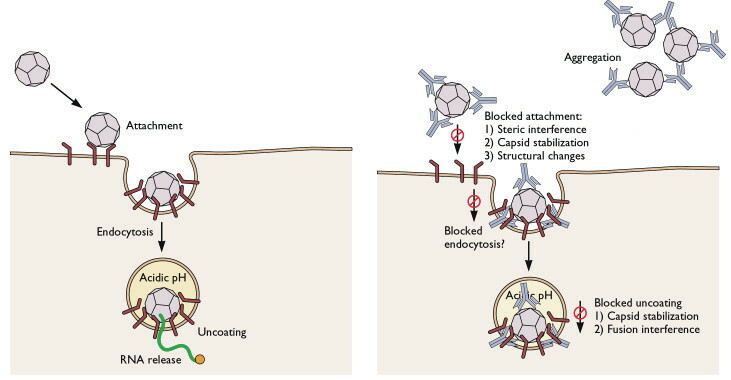 They may interfere with virion binding to receptors, block uptake into cells, prevent uncoating of the genomes in endosomes, or cause aggregation of virus particles. Many enveloped viruses are lysed when antiviral antibodies and serum complement disrupt membranes. Non-neutralizing antibodies are also produced after viral infection. Such antibodies bind specifically to virus particles, but do not neutralize infectivity. They may enhance infectivity because antibodies can interact with receptors on macrophages. The entire virus-antibody complex is brought into the cell by endocytosis. Viral replication can then proceed because the antibody does not block infectivity. This pathway may allow entry into cells which normally do not bear specific virus receptors. Where in the body does antibody neutralization of viruses take place? Virions that infect mucosal surfaces encounter secretory IgA antibodies present at the apical surfaces of epithelial cells. Viruses that spread in the blood will be exposed to IgG and IgM antibodies. In fact, the type of antibody that is produced can influence the outcome of viral infection. Infection with poliovirus causes IgM and IgG responses in the blood, but mucosal IgA is vital for blocking infection. This antibody can neutralize poliovirus in the intestine, the site of primary infection. The live attenuated Sabin poliovirus vaccine is effective because it elicits a strong mucosal IgA response and provide intestinal immunity. In contrast, the injected (Salk) polio vaccine does not produce intestinal immunity, and therefore is less effective at preventing spread of poliovirus in a population. The vast majority of influenza vaccines are administered by injection and stimulate the production of IgG antibodies; they are poor inducers of mucosal IgA antibodies. The efficacy of influenza vaccines would likely be markedly improved if they could be designed to stimulate mucosal immunity. Flumist is a licensed, intranasally-administered infectious virus vaccine that has been shown to stimulate both mucosal and systemic immunity. Nine clinical trials have been conducted in children comparing the efficacy of Flumist with inactivated vaccine or placebo. An analysis of the results suggests that the intranasally administered vaccine is more effective in preventing influenza. These results underscore the role of local immunity in resistance to respiratory pathogens. Is there a good understanding of what different parts of the immune response the inactivated vs. live attenuated vaccines trigger? It seems like the attenuated virus should produce a CTL response (so I end up with a fair population of CTLs ready to clear infected cells when they start showing flu peptides on their MHC1 molecules). Is that right, or does whatever is done to attenuate the virus keep it from producing that kind of response? I'm wondering if this might become important, if most people get the inactivated vaccine. That should cause some selection of the flu virus to mutate the bits that stick out of the envelope of the virus (the H and the N), so that the antibodies can't stick to it. But the CTL response (as well as the Th1 response, I think) might not be selected against so strongly. I'm puzzled trying to reconcile two statements. 2. The Sabin polio vaccine is a “live, attenuated vaccine”. Also, I'm puzzled by this ostensibly counterproductive relationship (on occasion) between non-neutralizing antibodies and viruses when you state that occasionally these particular antibodies may actually ENHANCE infectivity. Does this mean that some of these non-neutralizing antibodies have the characteristics of “bad actors”? Do virus populations ever take advantage of this occasional infectivity quotient amplification by such non-neutralizing antibodies? Clearly the statement 'live, attenuated vaccine' is incorrect. virus may be one that enters cells via antibody-mediated uptake. known to change so as to avoid CTL killling. Thanks for the clarification on “live, attenuated virus” that I, as an informed lay person, have encountered on several occasions. That phrasing had led me to wonder if there was a controversy about whether viruses were alive. Clearly there is no controversy. Interesting about viruses possibly taking advantage of infectivity enhancing characteristics of selected antibodies. I often find the most fascinating stories in evolutionary biologies to be those discussing the co-evolution of two or more symbiotic organisms, as Lynn Margulis (originator of the notion that the distinct DNA in mitochondria is evidence of cells being a product of co-evolution) as she describes in “Acquiring Genomes: A Theory of the Origin of Species”. It would seem to be an interesting pathway for viral evolution. Sets of viruses may be evolving to directly enter the cell, while other sets may be evolving towards getting their “foot in the door” via alternate pathways such as this. Fascinating stuff, to me at least! Is it possible to know how many antibodies are needed to neutralize a virus? attachment sites with antibodies would be needed to block attachment. might act catalytically and block fusion. Thank you very much for your responses (very accurate and to the point). I am an influenza fan. I have also been doing some research on influenza for the past year, and I become more and more interested on the topic as I learn more about it. I read an article on Science this week about cross-protection between neutralizing Abs against 1918 HA and 2009 HA. I have always wondered if a 'multi-valent' vaccine (including multiple HAs, more than 3) would be more efficacious to generate a more protective response against new viral HAs. Has any lab tried this before? Is this a real possibility? Haha, that's a vivid explanation image. what purpose do non-neutralizing antibodies serve? what class of antibodies are these? I do have my chickenpox vaccine, is there any adverse effects if you have contact with a person with chicken pox? Many thanks for your fascinating blog and for posting some of your lectures online. I am currently learning about the dengue virus, and dengue heamorrhagic fever in particular. I had a few questions for you: Structurally and mechanistically (how it binds to a virus), what are the differences between a non-neutralizing and a neutralizing antibody? Also, is it possible to trigger the synthesis of neutralizing versus non-neutralizing antibodies by B cells? In the adaptive immune response, what will determine whether the antibodies produced are neutralizing or not? Or is this “neutralizing” capacity of the antibodies occurring at random during antibody production depending on the epitopes targeted? I thank you in advance for taking the time to answer. Thanks a lot for a very good explanation. Which classes (isotypes ) of antibodies can perform this function (neutralization of viral infectivity as well as toxins ) ?!! IgG & IgM & IgA ?!! Dear Prof. Racaniello, is it possible to design an epitope based vaccine against dengue that preferably elicits the production of neutralizing antibodies?? Ok, but what about the rabies virus. The rabies virus infects neurons. Are antibodies brought on by the administration of rabies immune globulin and vaccine able to find and destroy the rabies virus even after it has entered into a neuron? Ok, but what about the rabies virus. Are the antibodies brought on by the administration of immune globulin and vaccine able to find and destroy the rabies viruses even though they are sequestered inside neurons. I know an antibody is capable of entering a neuron, but what I’m wondering is: how does the antibody know the virus is in the neuron. Is it by luck that the antibodies enter the neurons and just happens to see the viruses? or does the antibody somehow know it’s there and go after it? Stock: CE803071 Model: 3 Series 2dr Cpe 335i RWD Condition: PRE-OWNED Body: Title: CLEAR Engine: 3. I don’t believe our immune system intentionally provides non-neutralizing antibodies. It is simply part of the process in finding sufficient antigen recognition. As the article implies, this is a negative occurrence as our macrophages will now bind to the viruses that have NOT been neutralized by the antibodies, leading to cell infection and death. Isn’t it more about the CELL evolving to let the virus in. Since virus’s are lifeless and don’t evolve.